Well you could possibly consider this a sequel to my earlier post - Hulu Canada. This time it's Pandora Canada or Europe which is the objective, if you haven't listened to Pandora you're missing something special. It's an Internet radio site which allows you to build radio stations which are personalised to your own tastes. It's part of the Music Genome project and it's wonderful, unfortunately Pandora is also now inaccessible in Canada, UK, Europe in fact to listed to Pandora you'll need to be in USA. This is what you'll get if you try and access Pandora outside the USA, a nice little letter explaining why you can't listen. Years ago they used to ask for a Zip code to prove you were in the US, so everyone just typed in a US Zip and that was the end of it. Nowadays they check to see where your IP address is registered and if it's outside the USA, you'll get the blocked message above. So how difficult is it to get access to Pandora outside the USA. Well actually not very difficult, compared to getting HULU up and running in Canada it's actually very simple. All you need is to hide your IP address so that Pandora thinks you're from the USA. You can search for anonymous proxies and look for ones to connect to on the internet. Remember to pick a US one though or you'll still get blocked. This works fairly easily, all you need to do is change your proxy settings in your browser or use something like 'foxy proxy' to switch them if you're using firefox. This method works unfortunately it does require a lot of work, finding a free proxy to listen to Pandora in Canada can sometimes take quite a time, the majority of servers are extremely slow and unusable for streaming audio and they also disappear daily. But if you're happy to spend the time switching proxies to listen to Pandora it usually works. 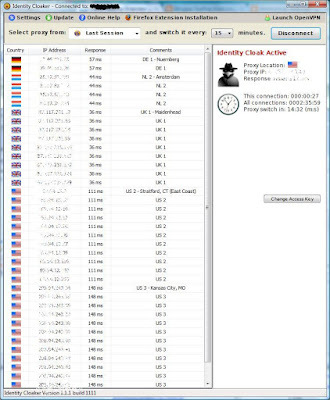 Fortunately my security software Identity Cloaker allows me access to a private network of proxies in lots of countries, including multiple US servers. All I have to do is switch to a US server and Pandora works fine. You can see from the next screen that simply selecting one of the US proxy servers allows you to listen to Pandora without problems. The screen here shows the Proxy selection page which allows you to choose whichever proxy you need. There are lots in Europe, Canada and the USA - for a security perspective it doesn't really matter as the proxy is simply a way to hide and protect your IP address, but of course it has a great advantage when trying to watch media in different locations. The beauty of this method is that I can connect and listed to Pandora whenever I want to, previously I'd usually spend between twenty minutes and an hour finding a suitable US proxy that worked, not to mention tweaking my proxy settings every time as well. Now I have the Identity Cloaker software sitting in my task bar and I can connect to whichever private proxy I need, a UK one when I want to watch BBC IPlayer, a US one for Hulu and Pandora, and if you speak French check out m6 replay which has some fantastic series only available in France (just select one of the French Proxy servers). It's security software and is extremely sophisticated and yet the private proxy network is worth a fortune in entertainment value alone - Operation Pandora Canada was a great success ! Here's brief video I made showing the process, it's simple to use. Why not try it out? To listen to Pandora in Canada whenever you want it couldn't be simpler. It's extremely simple to use, and at the moment you can try the trial version of Identity Cloaker for 10 days for a few dollars and see for yourself - Trial of Identity Cloaker. Is there Identity Cloaker for Mac? There's one in development, should be a full version of Identity Cloaker out next year for the Mac. If you're interested in a Pandora Proxy, you might be interested to know that there is an Identity Cloaker Beta version available for the Mac. It's not got the VPN function complete yet but gives full access to all the proxies in the network including Canadian, US, UK, French ,German, Irish and Dutch proxies. I've got some 10 day trial accounts available if anyone wants to try it out - email me using the Contact Us button above - but remember the Mac version is still in beta so it has a couple of little rough edges.